This is a story of truth. But since perception is truth, truth has many versions. In Trust Me, readers sometimes won't be able to tell what is truth and what is not. Neither can journalist Mercer Hennessey. Mercer has left her job to grieve the deaths of her beloved husband and daughter who were killed in a horrific car crash. The depth of her sorrow is such that even after a year, grief has not begun to release its claws from her heart. She deliberately keeps track of the days since their deaths by marking each one on the steamy bathroom mirror every morning. It's her way of keeping them close, keeping them alive. Every day, every hour, every minute is a struggle to keep body and mind together, and the author makes sure readers feel that pain, too. In an attempt to help her reconnect with life, Mercer's former editor Katherine Craft brings an assignment that is sure to earn Mercer hefty royalties as a bestselling author. That assignment? Write a true crime book about the ongoing trial of Ashlyn Bryant, accused of murdering her two-year-old daughter. Mercer is reluctant at first, but agrees because she needs the money. Writing the book on a six-week deadline should be a slam dunk. Everyone knows Ashlyn is guilty, and the jury is certain to convict. But they don't, and at Katherine's insistence, Mercer's book of guilt becomes one of redemption. And to be sure the truth (there's that word again) is properly told, Katherine arranges for Ashlyn to not only co-write the book with Mercer, but temporarily move in with her so they can write it together. The editor hopes that the two women who have tragically lost daughters will find mutual healing by working together this way. Mercer simply hopes Ashlyn will confess during the collaboration thereby buttressing her own steadfast belief that the jury got it wrong, and that Ashlyn is indeed a child killer. It isn't long, though, before fleeting moments of indecision begin to set in. Ashlyn's explanation for her daughter's disappearance contradicts previous statements and some courtroom witness testimony. After a while, her convoluted version of what really happened seems to make sense, but when Mercer pointedly asks if Ashlyn is responsible, Ashlyn deflects, redirects, and gives differing answers, all of them vague, at the same time pointing fingers and blaming others who may or may not exist. Readers find themselves with an Alice in Wonderland mindset that forces them to question what is real? As Ashlyn's version of the truth gets wilder and more inconsistent, Mercer finds herself beginning to accept even the most implausible theories and explanations as truth. Then again, they could all be made up. As the book deadline draws near, Ashlyn's truth about her daughter becomes intermingled with Mercer's truth about her own daughter. Soon everything is true, and then nothing is true, and they wind up searching for a truth that isn't there. Readers are advised to take their time with this book as its intricate, mindful plot requires thoughtful reading. The real truth does come out at the end of this suspenseful journey, but they won't want to miss the sights along the way. At a recent book signing at The Poisoned Pen book store in Phoenix, the author discussed the inspirations that led to the writing of this book. She talked about how one day her husband, a defense attorney, was practicing a closing argument at breakfast. She listened, nodding and agreeing with what he asserted, and it occurred that on the other side of town, the prosecutor's wife was probably doing the same thing. Each had their own truths, but they were diametrically opposed. Besides being an award-winning author, Hank Phillippi Ryan is a real life award-winning investigative reporter at Boston's WHDH-TV. As such, she had been asked to write a true crime book about the Casey Anthony murder case. When that jury declined to convict, the book project fell through, but the germ of Trust Me was firmly planted. "I took a chance with Trust Me—by tackling one of the most impossible topics facing us today," she said. "And I asked—how do we know the truth? How do reporters—here, the fictional Mercer Hennessey—decide what to write? What to declare as the truth? This book surprised me on every page. It changed my life. I think about it every day." 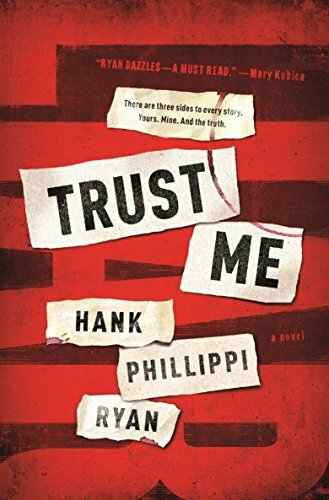 Trust Me is the author's first standalone psychological suspense. It's an engaging, powerful, important book. Readers will experience a full range of emotions and going forward will surely look at the truth in a new way. Award-winning author C. C. Harrison's most recent novel of suspense is Death by G-String: A Coyote Canyon Ladies Ukulele Club Mystery. Her book Death by G-String is a finalist in the 2018 American Fiction Awards.